The R.I. Convention Center Authority said Tuesday it will put up the $43 million needed to build a parking garage adjacent to the Garrahy Judicial Complex on Dorrance Street in downtown Providence. “The transformation of the current surface parking lot represents a unique opportunity to addres current parking capacity deficiencies and provide a mechanism to promote economic development,” said James Bennett, the convention center authority’s chairman. Bennett also serves as economic development chief for the City of Providence. No word on a possible RIPTA hub in the article. The contrast between his testimony and Steve Larrick’s of Central Falls Planning Dept. couldn’t be clearer on the Olneyville McDonald’s/Family Dollar project. He’s also a big donor to Michael Solomon’s campaign. As you can clearly see in the picture, lack of parking is a huge, huge problem. If they don’t build this garage, people may be forced to park within 5 feet of another car. Unacceptable, I say. the increase in car density is a no-no, but at least it will be a building with first floor retail. Garrett Hardin wrote an essay “Tragedy of the Commons” that argues each agent rationally seeking to maximize their self-interest will act in a way that ruins the “commons” for everyone. Examples used were actually grazing on a public commons or ocean fishing (where each fisherman reaaons better get the last fish before someone else does.) No use appealing to conscience, that only penalizes those with a conscience, only mutually agreed upon cooercion to limit use will help. and the transit system, still neeed for those who cannot drive, cannot succeed. Neighborhoods are split apart and are blighted by highways, Climate change, urban sprawl, racial/social segregation are enhanced. No use apealing to conscience, (though Ripta says environmentalism gets them significant number of riders) only a major change of policy could change this. It would take limiting and charging for parking, building protected bike lanes, encouraging mixed use zonong where more could walk to work, having motorists pay full cost of local roads (its only about 1/3 now according to the tax foundation) and improving transit rather than downgrading it as they are now doing in Kennedy Plaza. More parking? As someone else here said, at least it’ll be first floor retail. 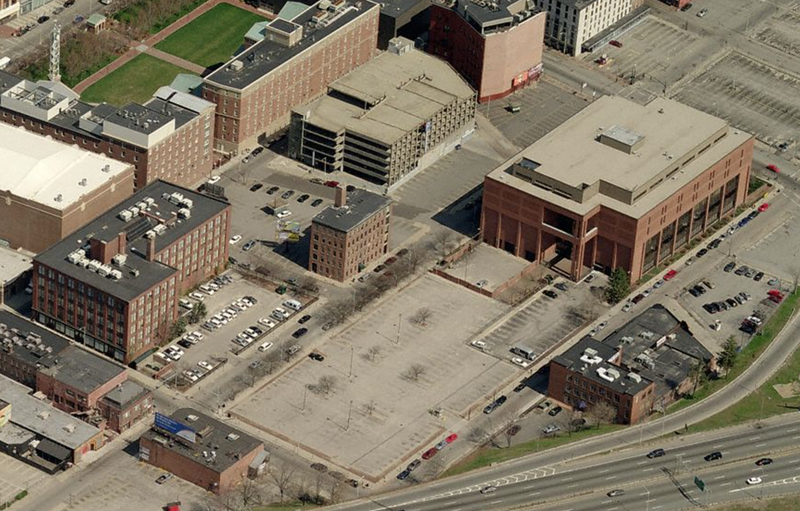 Take a look at PVD from an aerial view, it’s a lot of parking lots. If you can’t find a better economic use for downtown space than parking lots that speaks volumes about the city. Thomas Mann, formerly Executive Director of the Pawtucket Foundation, created an awesome map of downtown Pawtucket illustrating that 60 percent of it is surface parking. I’d love to see the same for downtown Providence. It is something like double the acreage of the 195 parcels. Thanks Jef; that’s exactly what I was thinking of. But no one goes downcity; theah’s noweah to pahk! Love how that image above is nothing but empty parking lots. Solution? Apparently more land and money devoted to free parking, who needs buildings, residents and businesses anyway? I think the garage (with bus hub and retail space) is a great idea … or would be, if at the same time the city would change the tax code to penalize surface parking.